I'm building a webApp with mobile support, and I'm facing a big issue when dealing with mobile screen and it's size limitations. It's important to note this webApp isn't about a single company. It's a multicompany service, this is why on the screen I'll show below, there is a big header with the company name (Model) and it's category (shoes - dress - shirt). The big tab and header is just at the beggining, once the user scroll down, they go up and don't fix at the top. Why am I using this tab? I'm using it with those 3 links (products, contact, info) because it's a multi-store webapp, it's not about a single company. So instead if I had it in the main-menu, the user wouldn't be able to access those pages until he selects a company and then the menu would appear. By putting this tab, I can show users how to access the company info, contact and products. As you can see, if I keep both elements: menu, search and FAB cart, they start to take too much space and conflict, specially when user opens up the keyboard to type on search. Note: All those 3 elements must be visible all the time, or at least in a obvious/very easy place to access. I was planning to mix the search field with the menu, once the user clicks to search, the field opens up to type. But I tought it was going to be very compressed as weel. Unless I remove the page title, which will take away the information about where the user is. I'm in a huge conflict on what to do in this case and I'm running out of options/ideas. What do you guys think? Focus on what the user wants: Products! Users don't come to an ecomm app to enjoy the UI. They want to shop. Start there and get everything else out of the way. Ask yourself, "How can the UI make shopping as simple as possible?" In my experience, the user has four primary steps. Check out as painlessly as possible. That's the whole "conversion funnel" your app should be addressing. "Contact" and "info" don't fit there. There is a lot of real estate at the top of the view dedicated to not shopping. That's a bad sign. Why place the three tabs across the middle of the view? In Material tabs usually live at the top; in iOS, it's at the bottom edge. In this case, Contact and Info seem inappropriate for such dominant navigation. Placing the search box in the middle of the page will slow users down. When they come to the app with a search term in mind, they'll look at the top. According to Google, "Not every screen needs a floating action button". Put the cart in the top right of the header where users expect it. Then you have the freedom to introduce the FAB for something like add to cart on the product detail page. 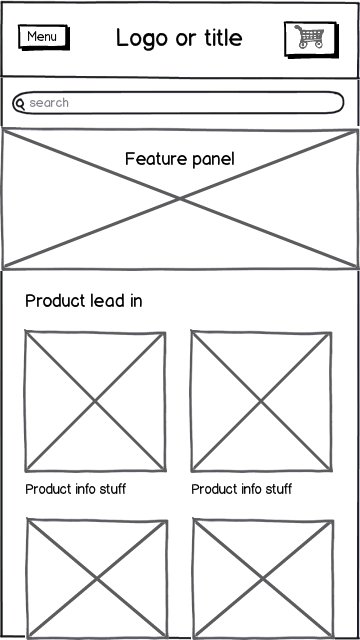 In the simple wireframe below, you're in the Products area because that seems like the right place to start. Contact and Info can be accessed in the menu and exposed in the footer. I can't imagine an e-comm scenario where those two things are of primary importance to the user. Not the answer you're looking for? 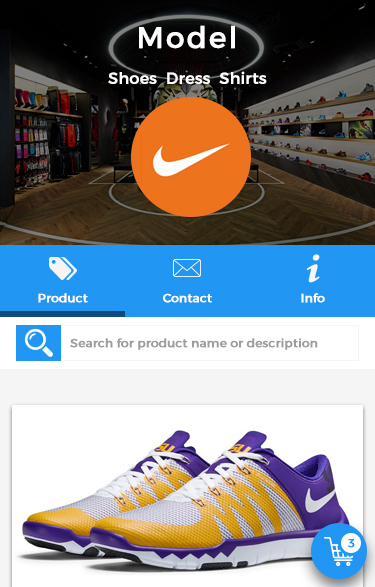 Browse other questions tagged gui-design e-commerce mobile-application or ask your own question. Is a search bar needed for small e-commerce sites? Can a site have both a “load more” button and pagination (depending on content type)?